Panama - "Crossroads of the World"
For years Panama has been known as the "Crossroads of the World" because of the Canal, but tourism to Panama has recently expanded. The long-protected areas of the Canal Zone are now open to visitors; former canal buildings have been modernized to provide first class hotel accommodations, while limiting intrusion into these hidden, natural areas. Guided hikes through rainforests and boat trips on the canal offer new adventure. The previously unexplored highlands of northern Panama have a cooler climate and rich biodiversity. You can end your visit to Panama with a restful and relaxing stay at an all-inclusive beach resort that boasts all the modern amenities of an international hotel, just a few hours from Panama City. For the adventuresome, we recommend a visit to Bocas del Toro on the north Caribbean Coast, or an off-the-beaten-path snorkel and dive trip. Day 1: Arrive Panama City Meeting service at the airport and transfer to the hotel of your choice. Day 2: Panama Three Cities Tour Panama City Is a vibrant, cosmopolitan and beautiful city, Capital of the Republic of Panama, and located at the Pacific side of the American Continent. Built in 1519 by Pedro Arias Davila, a Spanish Governor, it has been considered as one of the most important citiesof the Americas. 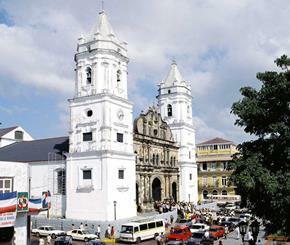 Casco Viejo: The oldest sector of modern Panama City, founded in 1673, it is known as the Casco Viejo. This beautiful little area has several attractions that tourists shouldn't miss and can easily be covered in a walking tour of a few hours. A monument to the French entrepreneurs who began the Panama Canal stands at the bayside end of the Casco Viejo. There is also an adjacent art museum in the converted strong house, known as Las Bovedas, once used for storing gold. Other points of interest are the famed flat arch or Santo Domingo Church, the beautiful gold-plated altar of the San Jose Church, the Panama Canal Museum, the National Theater, the National Cathedral (right), the Presidential Palace and other numerous colonial churches and monuments. Participants will have the opportunity to do a walking tour at the Casco Viejo section, walking by monuments such as the Plaza Bolivar, the San Francisco de Asis Church, Bolivar Palace and the National Theater; 'Las Bovedas Promenade', with one of the most spectacular views of Panama City. Day 3: Transfer to the airport, or extend your stay in Panama with additional destinations. Note: Minimum of 4 participants to operate shared basis. Note: Minimum of 4 participants to operate. 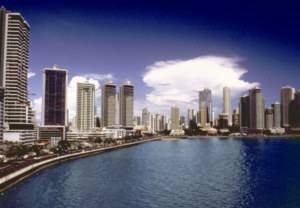 Today you will be provided with a tour of Colonial Panama City, and the ruins of Old Panama. You will visit some of the most important sites of Panama City starting with the ruins of Old Panama “Panama La Vieja". Founded in 1519, the it was the first city and first settlement on the Pacific Ocean. You will visit the capital, "Castilla de Oro" that was the center of operations for the conquest of South America. This city was built during the 16th century and was later partially destroyed by the attack of the pirate Sir Henry Morgan in 1671. You will then visit Casco Viejo, a colonial area that represents the second Panama City, characterized by a very special architecture. Weather permitting, this tour will be a walking tour taking you through the “Plaza de la Independencia" with its Cathedral and the “Palacio Municipal”. Next visit San Jose Church and its Golden Altar, followed by the “Arco Chato” and the “'Convento de Santo Domingo”, home to the Religious Artifact Museum. Head up the “Paseo de las Bovedas” into the “Plaza de Francia” and finish at the Plaza Bolivar, home of the national theater San Fransisco of Asis Church and some newly remodeled homes. Casco Antiguo: The oldest sector of modern Panama City, founded in 1673, it is known as the Casco Viejo. This beautiful little area has several attractions that tourists shouldn't miss. A monument to the French entrepreneurs who began the Panama Canal stands at the bayside end of the Casco Viejo. There is also an adjacent art museum in the converted strong house, known as Las Bovedas, once used for storing gold. Other points of interest are the famed flat arch or Santo Domingo Church, the beautiful gold- plated altar of the San Jose Church, the Panama Canal Museum, the National Theater, the National Cathedral, the Presidential Palace and other numerous colonial churches and monuments. Participants will have the opportunity to do a walking tour at the Casco Viejo section, walking by monuments such as the Plaza Bolivar, the San Francisco de Asis Church, Bolivar Palace and the National Theater; "Las Bovedas Promenade", with one of the most spectacular views of Panama City. 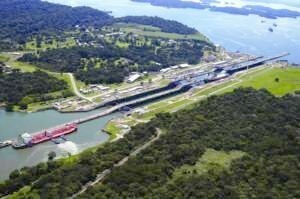 There are several ways to visit the Panama Canal. 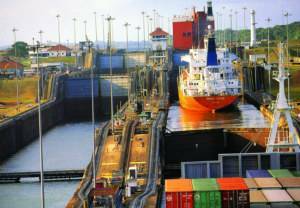 The closest and most convenient are the Miraflores Locks right outside of Panama City. These are the tallest in the system due to the extreme tidal variation in the Pacific Ocean. On Saturdays a tour operates that provides a partial canal transit through the Miraflores and Pedro Miguel Locks and then cruises the famous Gailliard Cut, a nine-mile excavation through Panama's backbone, to Lake Gatun. During the transit you will have the opportunity to experience and hear explanations of one of the modern wonders of the world. Arrive at Gamboa on Lake Gatun and motorcoach transfer back to Panama City. Early morning pick-up at your hotel and transfer to Dock 18, for a 7:30 a.m. departure on board one of the ships that will transit the Panama Canal starting with the Miraflores Locks, left, (the tallest in the system due to the extreme tidal variation in the Pacific Ocean). Then you will cruise the famous Gailliard Cut, above, right, a nine-mile excavation through Panama's backbone, through to Lake Gatun. During the transit you will have the opportunity to experience and hear explanations of one of the modern wonders of the world. Arrive at Gamboa on Lake Gatun and motorcoach transfer back to Panama City, arriving Pier 19 at about 1:00 p.m. Return transfer to your hotel. Early morning pick-up at your hotel and transfer to Dock 18, for a 7:30 a.m. departure on board one of the ships that will transit the Panama Canal starting with the Miraflores Locks, above, (the tallest in the system due to the extreme tidal variation in the Pacific Ocean). Then you will cruise the famous Gailliard Cut, a nine-mile excavation through Panama's backbone, through to Lake Gatun. Crossing the lake you will pass the Smithsonian Institute's Barro Colorado Island with its lush, beautiful jungle scenery. During the transit you will have the opportunity to experience and hear explanations of one of the modern wonders of the world. Arrive at Cristobal Port on the Caribbean side of the canal about 3:30 pm and motorcoach transfer back to Panama City, arriving Pier 19 at about 5:30 p.m. Return transfer to your hotel. Another fun trip is the train trip to Colon, called the Train & History Tour. 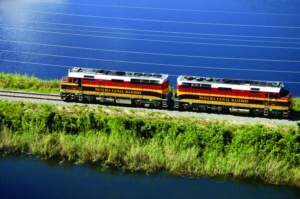 The Trans-Isthmian train was the first transcontinental train in the world, running parallel to the Panama Canal. The train combines luxury on board with extraordinary views along the rainforest. The train has an open car where visitors can enjoy a drink, and the passing scenery of this historic route, alfresco. Visitors travel from Panama City to Colón, from one ocean to another, in one hour, catching sight of ships in the canal and the colorful life of Panamanian towns in addition to the rainforest. Upon arrival at Colón visitors are escorted to the historic Spanish settlement of Portobelo before returning to Panama City. 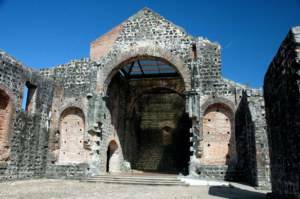 Portobelo introduces visitors to the adventure and intrigue of the age of pirates and conquistadors. Visitors tour the forts and newly restored customs building in addition to the local church, which houses the famous "Black Christ." Morning pick up at your hotel for a full-day tour to Agua Clara Visitor Center. The center offers a breathtaking panoramic view that contrasts two particular scenarios that generate mixed feelings. On one side you will find the famous Gatun Lake, where cargo ships or other vessels transit every day, while on the other side, but from a different perspective, you will be amazed by the view of the expansion works. Beyond its surprising technology or colossal machinery, you will be astonished by the work of thousands of people, who have worked on this colossal expansion. Once you finish the visit to the Agua Clara Locks, you will drive through the rainforest that surrounds this Caribbean Coast until you reach the important historical Fort of San Lorenzo, located on the west side of the Panama Canal, right at the mouth of the Chagres River. You will go back to the time of pirates like Henry Morgan; who managed to access Panama City in 1671, using the channels of the Chagres River; passing through the Fort of San Lorenzo, leaving the city looted. The fort was built with blocks of cut coral and raised rows of cannons for the defense of pirates and corsairs. Most of the Fort of San Lorenzo is well preserved, including pits, canyons, and arched rooms. A delicious lunch will be served in a local market before returning to to your hotel. Morning pick up at your hotel for a full-day tour to Agua Clara Visitor Center: The center offers a breathtaking panoramic view that contrasts two particular scenarios that generate mixed feelings. On one side you will find the famous Gatun Lake, where cargo ships or other vessels transit every day, while on the other side, but from a different perspective, you will be amazed by the view of the expansion works. Beyond its surprising technology or colossal machinery, you will be astonished by the work of thousands of people, who have worked on this colossal expansion. Once you finish the visit to the Agua Clara Locks, you will drive through the rainforest that surrounds this Caribbean Coast until you reach the town of Portobelo, where you will be able to appreciate beautiful green landscapes. Portobelo is a sleepy bayside town full of colonial history where you will feel transported back in time. Here, you will encounter no less than five colonial fortifications where the canons are still pointing towards the bay they once protected. Portobelo is also home to the statue of the Black Christ, which according to the legend possesses divine powers, that has several times prevented the statue from being removed from here. Other monuments of interest are: The Custom House (counting house) built in 1640 and the Hospital Chapel built in the year 1597. Gamboa, 30 km. north of Panama City, is a small town on the east bank of the Panama Canal, north of the Chagres River. 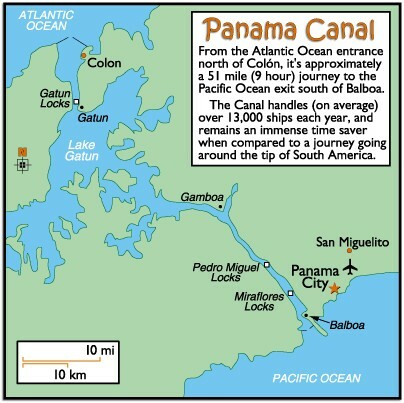 In the early 1930s the Panama Canal Company constructed Gamboa at the confluence of the Panama Canal to house its Canal Maintenance (Dredging) Division. The facilities are now closed and the buildings have been restored to accommodate tourists who want to visit the 22,000-hectare Soberania National Park. This is a protected area containing a wide variety of forest and freshwater habitats, administered by Panama's National Authority for the Environment (Autoridad Nacional del Ambiente, or ANAM). Day tours from Panama City are available, most notably, the Pipeline Nature Trail, the Gamboa Combo Pack and the Mega Gamboa Combo Pack. NOTE: Minimum 4 participants to operate! Experience the verdant rainforest of Gamboa from within, ascending some 280 feet from the shadowy forest floor, through the dense undergrowth and up to the sun drenched canopy with its thousand shades of green that are only interrupted by the vibrant colors of flowering trees. Once at the top, you will have the opportunity to climb our observation tower (also accessible for wheelchairs) from where you will have uninterrupted views of the vast rainforest of Soberania National Park while at the same time watch the giant cargo ships maneuver through the Galliard Cut (the narrowest part of the Panama Canal). Once you finish the visit to the Aerial Tram and Natural Exhibits, you will experience an exhilarating 20-minute ride at high speed right through the heart of the Panama Canal. The boat will slow down and enter the labyrinth of jungle-covered islands of Gatun Lake. In this protected area the wildlife is plentiful, and you are likely to encounter capuchin monkeys, 3-toed sloth, howler monkeys, various kinds of toucans and other bird life as well as caimans, crocodiles, turtles and a wealth of butterflies. This is an exceptional place to experience the sights and sounds of the jungle up close. The trained naturalist guides will ensure that you have an outstanding nature experience by tracing the wildlife as well as educating you about it and its habitat throughout this exceptional jungle and canal adventure. This is a tour anyone can do if you eliminate the climb to the Observation tower and becomes only moderately difficult if you choose to climb the 100-foot tower. Finally the tour ends with a visit to the Miraflores Locks. During your visit to this engineering marvel, you will get the chance to see the Canal gates of Miraflores Locks. The locks function as water lifts: they raise ships from sea level (the Pacific or the Atlantic) to the level of Gatun Lake (26 meters above sea level); ships then sail the channel through the Continental Divide. Morning pick up at your hotel for a half-day nature tour. The Pipeline Road is a moderate, approx. 13.7-mile trail within Soberania National Park's 55,000 acres of tropical rainforest. This abandoned service road remains pretty much flat and passes through a mature forest track. Soberania National Park boasts an impressive list of 525 species of birds and 105 species of mammals. This is not a loop trail, so hikers can enjoy a hike suitable to their physical abilities and walking speed and return on the same route. The journey starts with a two-hour drive west from Panama City to Anton Valley (below). 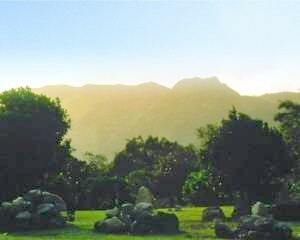 At 1200 feet above sea level, The Anton Valley offers a number of attractions to visitors, which you will visit: The Square Trees petroglyphs, El Macho Waterfall, ecological areas, thermal waters, and the town craft market shop which is crowded on Sundays by everyone in the town. Lunch is included and then return to Panama City. 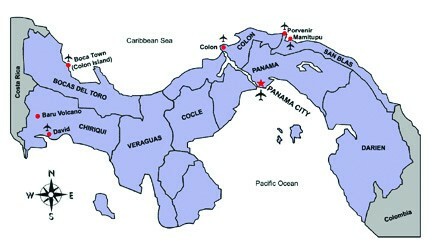 The journey starts with a two-hour drive west from Panama City to Anton Valley. At 1200 feet above sea level. The Anton Valley offers a number of attractions to visitors, which you will visit: The Square Trees petroglyphs, El Macho Waterfall, ecological areas, thermal waters, and the town craft market shop which is crowded on Sundays by everyone in the town. 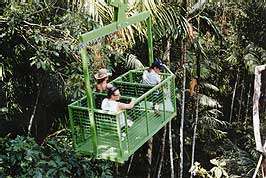 Lunch is included, followed by the "Three Trees Canopy Adventure," where you speed along on a zipline between three platforms at the top of the rainforest canopy.